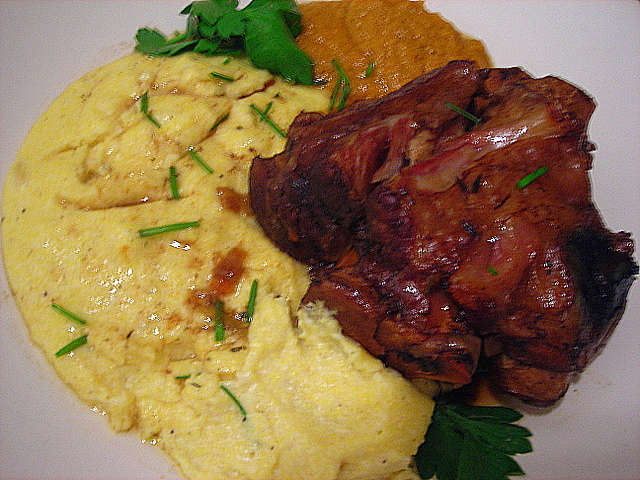 In classical Italian cuisine, osso buco (literally, “hole bone”) is a dish that hails from the city of Milan in northern Italy. It is traditionally made with veal shanks and braised in a sauce of white wine, aromatic vegetables and herbs, then paired with risotto alla milanese. Modern versions use a tomato-based sauce as the braising liquid and dispense with the risotto in place of polenta. Shank meat has become increasingly popular in the restaurant world over the past few years. These cuts are relatively inexpensive but have a tremendous amount of flavor, and if cooked slowly in moist heat, become very tender. Shanks are also nearly impossible to screw up — well, unless you decide to take a nap halfway through cooking dinner. I picked up some fresh pork shanks last week from the Greenmarket. You might know them better as uncured ham hocks. Season pork shanks generously with salt and pepper. Heat oil over medium heat until hot but not smoking. Working in batches, brown the shanks on all sides, approximately 5-8 minutes. Transfer to a platter when done. Pour off all but 3 T. fat from the pot. Add onions and cook, stirring occasionally, until translucent, about 5 minutes. Add carrots and celery and cook, stirring occasionally, for about 5 minutes. Add the garlic, thyme, cloves and bay leaf and cook, stirring for 1-2 more minutes. Return shanks to pot and add wine, vinegar and stock. The liquid should come about halfway up the sides of the shanks. If not, add more wine or stock. Bring to a simmer and skim any film off the surface. Cover, place in the oven and cook until the pork is tender, about 2 to 2 1/2 hours. To check for doneness, plunge a fork straight down into the meat and try to withdraw. If the fork slides right out, the meat is done; if not, give it more time. To make the chutney: Combine all ingredients in a Pyrex baking dish, cover with aluminum foil and place in the oven beside the shanks. Cook until tender, stirring occasionally, about 2 to 2 1/2 hours. When done, let cool. Pour vegetables and liquid into a blender. Puree on high speed for 1-2 minutes. This keeps 3 to 4 days in the refrigerator, and is a great substitute for ketchup. To make the polenta: Melt butter over medium-low heat. Saute onion until golden brown, about 5 minutes. Add milk and stock and bring to a boil. Slowly add cornmeal in a steady stream, whisking constantly. Bring back to a simmer, whisking to break up any lumps and cook, stirring frequently, until the polenta is thick and creamy but not so thick that a wooden spoon stands up by itself, about 10-15 minutes. If the polenta is too thick, add more liquid but be careful not to add too much or the mixture will become soupy. Stir in the cheese and check seasoning. Plan for one shank per person. Leftover polenta can be shaped into cakes and fried in butter. Note: For this recipe, all measurements are approximate. I’m rarely this exact but I recognize that some people may not be as experienced in the kitchen. 27 Dec	This entry was published on December 27, 2007 at 8:51 am and is filed under food, general. Bookmark the permalink. Follow any comments here with the RSS feed for this post.